Up until a few years back I wouldn’t have been seen dead in a second hand shop or charity shop. I used to have all the usual preconceptions that others alike shared. I thought only old biddies (I use the term with fondness not in the derogatory sense mind) with nothing better to do other than to spend their time perusing round each and every one buying out dated clothes, ancient home wares and endless jigsaws. 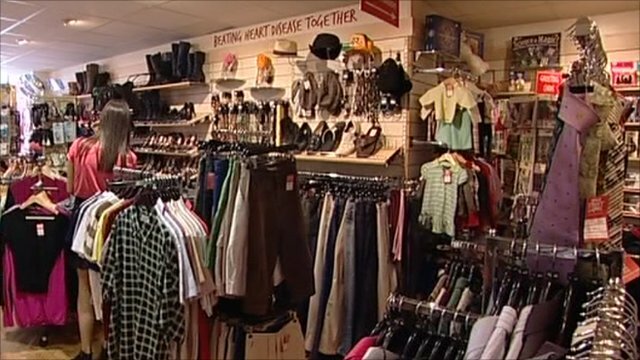 But contrary to popular opinion or more accurately popular misconception, charity and second-hand shops are the place to shop! 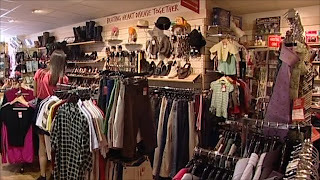 For a good while now I have been going in charity shops up and down the country, whenever we are away somewhere or happen to be in a different part of the country and come across a thrifty shop my feet just take me in there. I have bought allsorts from the weird to the wonderful and before shopping anywhere else I always scope out the local charity or second-hand shops. Hardly ever have I seen any ladies with a blue rinse or solely gents old enough to be my Grandfather or Great-grandfather for that matter. My own Grandfather is actually a rather young sixty-six year old. He does at my recommendation of course shop at charity shops and second-hand stores. He’s always on the lookout for a rare or unusual musical instrument to add to his ever expanding collection despite my Grandmother’s protests. He also is looking for a cheap pair of size tens clogs, preferably with a tap sole should anyone come across any! 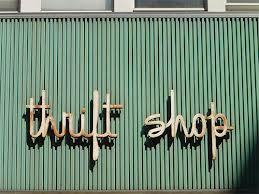 When perusing these shops I regularly come across a whole array of different people from all walks of life, each of them buying something different which I find interesting and further adds to the charm of these fabulous thrift stores! So what I am trying to get at, is Charity Shops and Second-hand stores are for everyone not just the Silver-Foxes out there! My Aunty whom first got me into charity shop buying quite often comes across designer clothing and handbags. 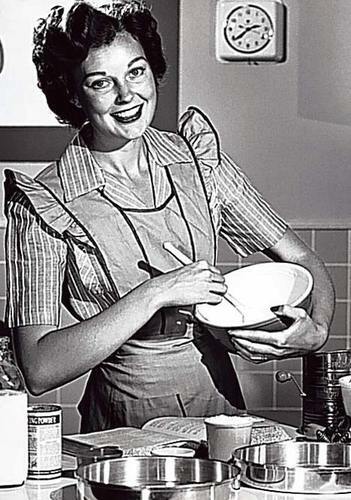 Personally I am always looking out for Chick-Lit novels, good DVDs, the odd item of clothing and vintage finds but mostly cute kitchenalia. 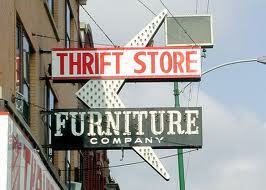 These thrifty stores are filled with all sorts of brilliant finds. As for my Aunty she gets an array of things from toys for her children, fabulous clothes for her and the kids, things for their home. Much to her husband’s (my Uncle) dismay. You see he thinks as long as you have all the practical stuff and your home is clean and tidy you don’t really need all the extra bits and bobs that make a house a home, I think he’s a secret minimalist in denial. Don’t get me wrong their home is beautiful and decorated wonderfully but he likes things neat and incredibly non-cluttered. So my Aunt has to protest to get little knick-knacks and bits and pieces through their front door, I’m sure he likes these things really but men need to be men and they to like to protest a little about all the feminine touches when they feel their BBQ’s, tools and Topgear DVD's are being pushed out to make way for more candles and photo frames etc. I have practically my own library at home (I wish- with chunky leather chesterfields, wingback chairs and dark book shelves filled from floor to ceiling with all sorts of books and light classical music playing in the background with cups of Earl Grey or iced tea on tap and a great big fat fluffy cat stat on a window-sill staring out into the countryside.) I do have the books for one, we are running out of shelf space and we occasionally buy Earl Grey, oh and I do own a wingback that I still haven’t gotten round to re-upholstering but as for the leather chesterfields and wall to wall bookshelves we don’t, as for the cat I’m working on it. It’s not our dog that would mind-he likes most animals –apart from horses and the occasional goose but it is Mr N I need to work on. He said maybe for Christmas …………. Note to self: add to Crimbo wish list and leave hints around the house nearer the time. As well as buying from charity shops and thrift stores, I never throw anything away without first asking myself could my trash be someone else’s treasure? The Story of Grange Farm.